It’s been two weeks since Miley Cyrus twerked her way onto the “Former Child Stars Gone Bad” list. 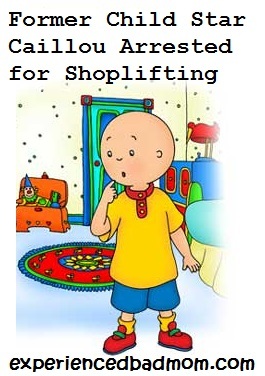 Former child star Caillou was arrested in Quebec on Saturday for shoplifting from Wal-mart. Caillou, best known for his seminal work on the hit children’s cartoon series “Caillou”, was stopped by security guards after they noticed suspicious lumps in his yellow t- shirt. Caillou was found to have toilet paper, light bulbs, socks for Rosie, and crayons on his person that he did not pay for. Witnesses at the scene described a bald young man in handcuffs wearing a yellow t-shirt, blue shorts, and red shoes. He was overheard whining loudly, “But whhhhyyyyy Mommmmmmyyyyyyy?” and “I caaaaaannnn’tttt” as he was led to a squad car. Caillou, now 21, is no stranger to controversy. He was arrested for DUI in 2010 and sent to rehab with his parents for pot addiction in 2011. While he has failed to replicate the commercial success of “Caillou” from the early years of his career, he has remained in the spotlight due to a string of high-profile relationships with Lindsay Lohan and Amanda Bynes. Former best friend Clementine was reached for comment. “I love Caillou and am praying for him,” she said of her former co-star. Caillou is estranged from his father, who had no comment. Caillou lives with his mother, in her basement, when he’s not living in a van down by the river. His sister Rosie seems to have chosen a better path after childhood stardom. She is married to Joe from Blue’s Clues and lives in California with their two children. As of press time a court date had not been set. hahaha my son loves that show. That voice drives me insane. You crack me up!! I would love to see the video of Caillou being arrested. That’s an episode I would definitely watch!! Ooo, that would be a good episode! Especially if Grandpa and Gilbert were guest stars. Cracking up at the thought of Caillou’s fall from grace. Seriously though, it’s very sad the stories we hear about so many celebrities. LOL for a moment when I saw the title I thought he really was arrested until I read the story. My sons always wondered why he was bald. I told them he was representing the kids with cancer. That was great! What an imagination! This is hilarious! My son also loves this show, but I’ve “banned” it from my house. Lol. I think my son became more whiney when he was watching it! Lol. Thanks for sharing! I’m pretty sure that increased whining is a side effect all kids experience from watching that show! Yeah, Joe seemed more appealing than Steve for sure. And thank you for saying it was one of the funniest things you’ve read in a long time. That warms my heart! Seriously. Alright, I need help and/or friends. That is too funny! LOVE that Rosie married Joe from Blues Clues. I always wondered what happened to him. I know, right? “Joe and Rosie” has a nice ring to it, too. The only thing my kids agreed on for about a year and a half was Caillou. So I am grateful to the little guy for that! hahahahaha, that was hilarious. I totally snorted at “in a van down by the river.” That’s another star gone bad story, I guess, isn’t it. And married to Joe from Blues Clues, ha! Thanks for a laugh. At least our little cartoon characters won’t change, at least much. Oh man! If any cartoon star was going to get into trouble as an adult it would be Caillou. He’s such a whiner! Adrienne recently posted…What really matters. LOL! I’m so glad I was able to wean both sons off Caillou pretty early! Really so annoying! Aw, shucks. Dora, huh? I’m thinking, I’m thinking! So funny! Caillou drove me crazy – he is so whiny!! But I’m a gal from Quebec, so I feel I must be loyal to the bald guy. Even if he does need some rehab! What was great about this post: All of it. Love. What was not so great? Having this song stuck in my head: Toilet paper, light bulbs, socks for Rosie, crayons. Christina recently posted…Let them eat cake (and cookies). For days. And now I’m singing it too. Extra special brownie points to you for knowing the tune I was referencing! Robbie recently posted…It’s MY BIRTHDAY!! This is hilarious! Thanks for a good laugh. Oh my God, there are no words to describe how much I love this post. I hate Caillou with a passion that shouldn’t even be legal. This.Is.Awesome. I’m sharing it everywhere, and also might be a tad bit in love with right now. Aw shucks! You know it makes me happy to hear how much you like this!